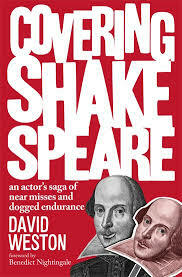 “Covering Shakespeare” is a successor to the author’s “Covering McKellen” which won the 2011 Theatre Book Prize. David Weston’s opening line speaks of “a mishmash of facts and reminiscences.” That may be. But one person’s mishmash is another’s rich and varied peregrination through personal, theatre and occasionally national history. Benedict Nightingale, in his foreword, declared himself at a loss when seeking an adjective to capture Weston’s earlier book. “Covering Shakespeare” similarly eludes genre. Among the actors and directors who parade by the score through Weston’s career high and low is Michael Simkins. Like Simkins Weston is an actor with a second gift for writing. 2014 will not have produced a wider, more spirited, or simply more enjoyable theatre book. To borrow a line from “Measure for Measure” “he that hath made you hath made you fair hath made you good”. Weston divides his address to the thirty-seven plays in two parts. The second, and chunkier, part is the author’s own experience, a journey of the ups and downs, reversals, joys and jolts of sixty years of a life in acting. The first, which he calls “tattle”, is a digest of information on the texts. Thus, “Titus Andronicus” was a significant success for Shakespeare in his own time but went unperformed for three hundred years. In 1955 a young and bold Peter Brook directed it with the Olivier-Leigh partnership. Weston’s amiable treatment of the plays encompasses historical arcana and selected critical barnacles. Germaine Greer surprisingly sees ” the Taming of the Shrew” as “not a knockabout farce of wife-battering but the cunning adaptation of a folk-motif to show the forging of a partnership between equals.” That was certainly a perspective that Terry Hands took to his mesmeric 2011 production for Theatr Clwyd Cymru. In his summary of the rehabilitation of the reviled “Titus Andronicus” he cites with caution Michael Billington. One of the most gore-soaked texts in theatre’s history becomes a Billingtonian “prolonged lament for the suffering imposed by an imperialistic society.” Weston approves whole-heartedly of the Guardian’s critic but, unusually for a theatre member, cares less for its politics. His survey of eight critics, some now retired, includes “arguably the dullest theatre critic in the history of the world.” The book also reprints some of the unpleasantnesses of Tynan, the personal cruelty to actors both unnecessary and demeaning. Weston’s index of actors is compendious. He sees some actors who rise, some who disappear and some who are lured away. An advertisement for television for a fast food chain offers £20,000 at a time when the Young Vic is paying £95 a week. Weston is third name in a war film after Kirk Douglas and Richard Harris. And then the film work simply fades away. The book is interwoven with biography. Weston is with the National Youth Theatre at the time of its 1956 inception. Early fellow-actors include the teenage Simon Ward and Colin Farrell. Stratford is still a market town where live sheep are delivered to the main street’s butcher. By the sixties Weston himself is to be seen in silk scarf and patent leather Chelsea boots at the wheel of a bright red Mini-de-luxe. At a career low point he descends to driving a shabby Ford Zodiac as a mini-cab. One of his passengers turns out to be Sir John Gielgud. They have played together in the big-budget film “Becket”. Sir John has no memory of his fellow actor. “Covering Shakespeare” has many a personal touch to it. On “Love's Labour Lost” “I thought Cole Porter's songs were the best thing in Kenneth Branagh's film.” Tony Richardson has “Othello” coming on stage with a pair of Great Danes. They require the construction of a special dressing room and the most junior props ASM is blamed for the dogs’ onstage farting and howling. The main text of “Covering Shakespeare” is bookended between a brief memoir of school days and synopses of the plays. Line summaries scene by scene reveal that Iago has eleven hundred and seventeen lines to Othello's eight hundred and eighty-eight.